Push Messages to GCM server using c#.net application (server side). Google Cloud Messaging (GCM) is a service that helps developers send data from servers to their Android applications on Android devices. Google Cloud Messaging (GCM) replaces the beta version of Android Cloud to Device Messaging (C2DM). The free service has the ability to send a lightweight message informing the Android application of new data to be fetched from the server. Larger messages can be sent with up to 4 KB of payload data. This tutorial explains about how to send message to GCM server using .net application. Then GCM server pushes the messages to particular devices. 1. First, create new web application (File/new/website/Asp.Net Empty web site). GCM storage if the device is offline (default:4 weeks). // your RegistrationID paste here which is received from GCM server. String sResponseFromServer = tReader.ReadToEnd(); //Get response from GCM server. Note: The above code is for sending single regID. To send mutiple regID's, you can send up-to 1000 regID's to google server once or you can loop the code. 4. After clicking send button you will get response from GCM server like id=343kdhgsy4y32i42@adfgd. It means that you successfully sent message to GCM server. 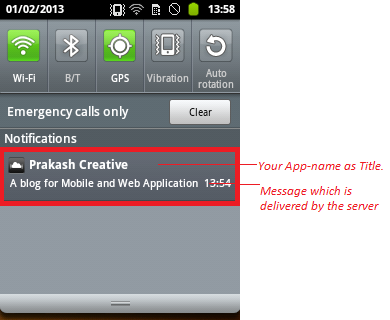 You will get message in your mobile like this..
For GCM Client side tutorial click here. Download the GCM C# server side code below. 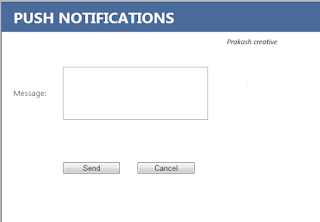 How to create Facebook Hash key for android apps ? After a lot of search i found that how to create Facebook hash key for android apps in both modes i.e debug and release modes. 1. First download oppenssl. click here to download openssl for windows. Download either 32 bit or 64 bit according to your system requirement. 2. Extract and copy it to your specific location. There are two processes to generate Facebook hash-key. one is from command prompt and another via code. 3. Firstly, open your cmd prompt and change your directory to your java jdk path. 4. Find debug.keystore from your android sdk install path like C:\Users\Teja\.android\debug.keystore. 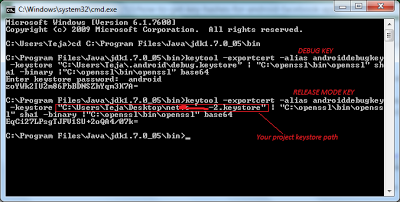 In case of RELEASE MODE key, copy yourProject.keystore. This one more important to generate your perfect hash key. Otherwise you will get an error like APP MISS_CONFIGURED. 5. And then find your openssl\bin copied & extracted location. 6. Run it and provide some password like 'android'. It will generates you hash key like below..
Use below code snippet to get hash key. Note: For release key, run your apk with eclipse then you will get hash key like above. 8. Go to Native Android Apps and paste your hash key in there.